Pace Wu (吳佩慈) attended Valentino Spring/Summer 2013 fashion show held during Paris Fashion Week at Espace Ephemere Tuileries in Paris, France on October 2, 2012. 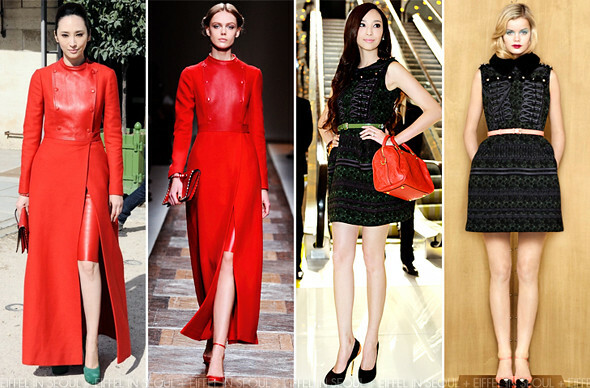 She was dressed in a red coat with a leather bodice and a red dress from Valentino Fall?Winter 2012 collection. A 'Rock stud' clutch and forest green suede pumps to complete her look. The Taiwanese star was also seen front row at Louis Vuitton Spring/Summer 2013 fashion show held at the Louvre on October 3, 2012. Wearing an embroidered mini dress from Louis Vuitton Pre Fall 2012 collection. A pair of Giuseppe Zanotti gold tone heel pumps. I would have prefer the green pumps for this look.